Love the site. 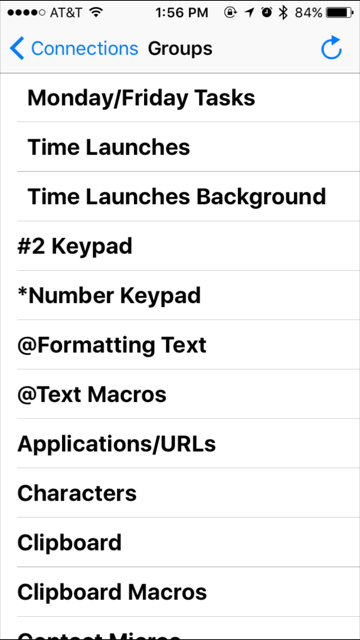 Quick question for you: what is the best way to launch Keyboard Maestro and/or Automator macros remotely from your iPhone. I feel like Workflow/IFTTT have to make this a possibility besides the semi-solution of monitoring a dropbox folder with Hazel. 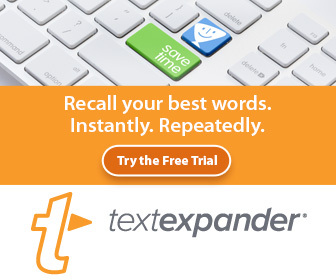 Have you heard of Otto…now Entangler? It seems it can do remote triggering, but there is no community or people using it it seems. This makes it hard to figure out best practices…..well really, any practices. But I’d love to see a short post on triggering from your iphone to your desktop/laptop! Thanks again! When it comes to remotely triggering macros and actions on your Mac, the automation applications, Keyboard Maestro, BetterTouchTool,and Alfred have you covered. 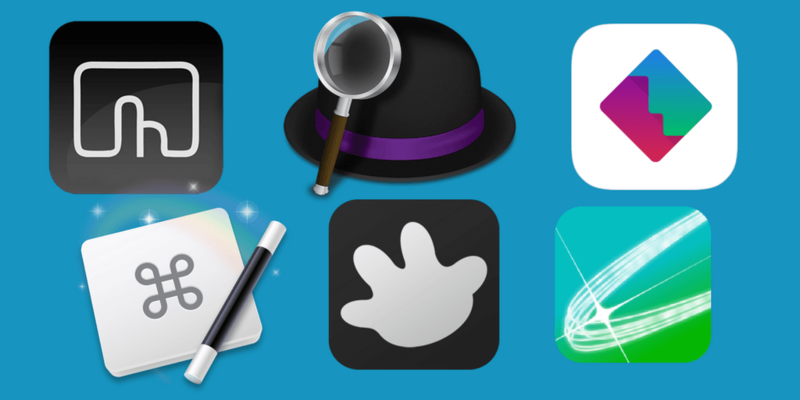 Each of these applications has a counterpart iOS app that allows for triggering your selected macros and actions. But I do use BTT Remote on occasion because it’s more useful than Apple’s Remote application. If you’re curious about these remote applications, read on. You might realize how one or two of them could come in handy in your daily workflow. BTT Remote is on the homepage of my iPhone. The app allows for creating actions that can be triggered from the remote app. I often use it for when my computer turns on late at night when I’m already in the bed. I simply open the app and tap the action, “Sleep Computer.” I also have another action for toggling Dragon Dictate on and off. This remote action comes in handy when I’m sitting in my recliner in my office and I forget to turn off Dragon Dictate, which I leave on throughout the day as I work. As the left image shows, the app can also be used as a remote trackpad, and it includes buttons controlling iTunes, and screen brightness. 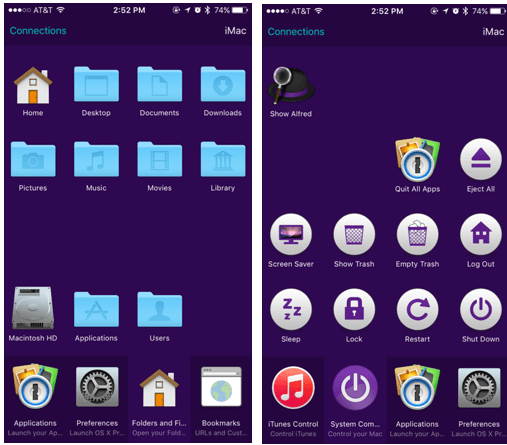 In addition, you can control your running applications in your Dock and in the menu bar. You can trigger any action in your BTT library. Thus, this makes BTT Remote is literally over a hundred times better than Apple’s Remote app, because that’s how many built-in actions BTT has installed, and you can create custom actions for all your needs. 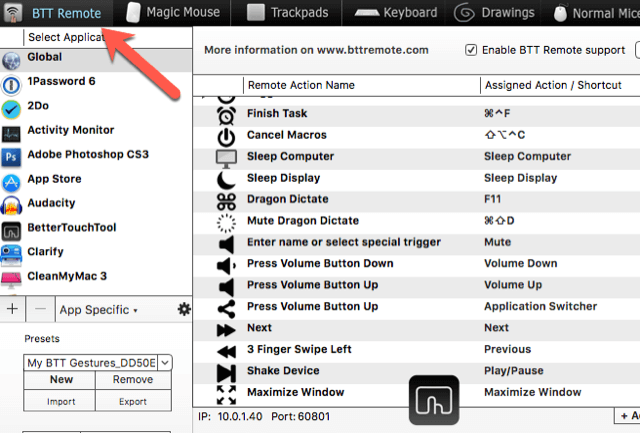 BTT Remote is free, but also has a Pro version for $1.99. Incidentally, BTT for Mac also has support for Siri and the new TouchBar available latest MacBook Pro. If you’re interested in learning more about BetterTouchTool, check out my online video tutorial course. 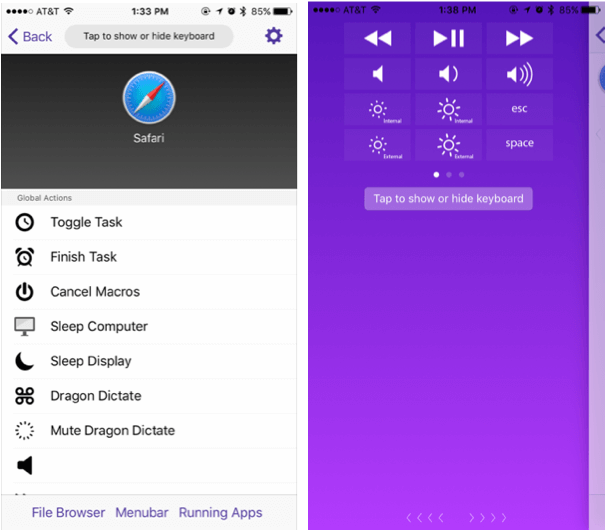 Keyboard Maestro also has its own remote app that provides access to your entire library of macros. 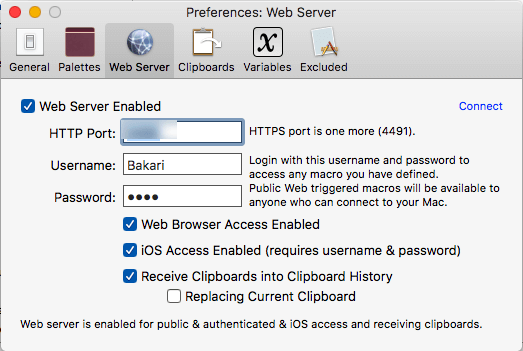 You may not not know it, but KM also allows access to your macros via the Internet from any computer if you choose to enable the feature in the application’s Preferences. The only drawback to Maestro Remote is that you can’t choose which of your macros you want included in the app, which makes it for me a little cumbersome to use. However, I’m still glad app is available, for I never know when it might come in handy. 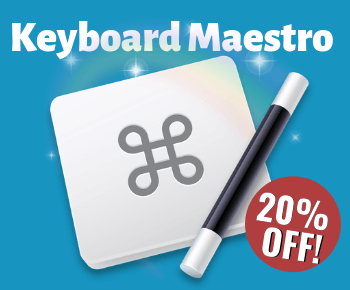 Keyboard Maestro Control is a free download. FullControl is another remote app I’ve had on both of my iOS devices for quite some time. I used it more as remote trackpad when my old Bluetooth Apple trackpad was giving me connection problems. FullControl is similar BTT Remote, but it offers more direct control to menu items your running applications. For example, in the Safari app, you can tap to close tabs, trigger the search and URL bar, zoom in and out of a webpage, access your Top Sites, etc. FullControl also allows for toggling screen brightness and even remotely typing in a text editor. FullControl is a free download. 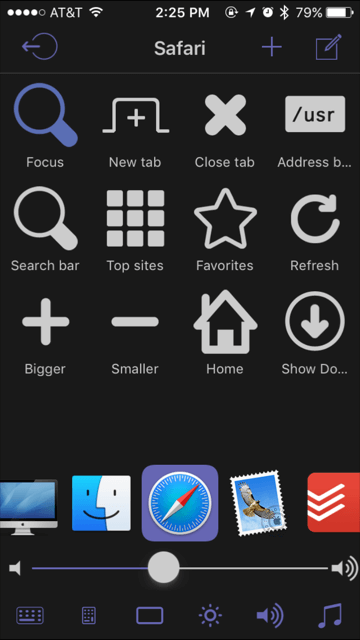 If you’re new user of the popular launching and search triggering application, Alfred, you might not know that Alfred also has its own iOS remote app. 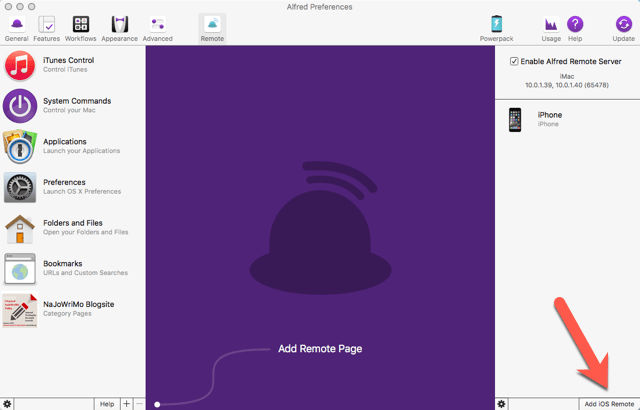 Alfred Remote triggers menu items for numerous applications including iTunes, System Preferences, Mail, Activity Monitor, as well as opening Safari bookmark and Finder folders. There a few other solutions out there that may warrant another article on this subject. The apps include Entangler (pointed out to me by Matthias Miller, who raised the Ask Mac Automator question for this article), that allows allows for remotely triggering Automator workflows, AppleScript and Unix shell scripts. Entangler for Mac is $9.99, and the iOS Entangler remote app is a free download. I haven’t tested Entangler, but I can say that it might not be needed if you’re already using one of the apps discussed above, because each of them can trigger Automator and AppleScript scripts. However, iOS Entangler does have a much better looking user interface design than the Maestro remote app. Quadro is another fairly new remote app that seems similar to Alfred Remote. Quadro provides lots of built-in macros for triggering actions on your Mac, including Safari bookmarks and new tabs, opening Finder windows, formatting text, creating new Mail messages, and the like. Quadro has a great design, and I can see how it might used on the iPad for triggering all types of actions for different Mac applications. Again, however, many of Quadro’s basic actions can be handled by the remote apps I’ve presented in this article. iOS Quadro is a free download, as well as Quadro Sync for the Mac. However advance feature and workflows requires a $9.99 annual subscription. I will probably do a full review Quadro in a future article. If you’ve used any of the above remote apps, please share your thoughts and use cases with me and my readers. If you have suggestions for other remote apps, please also let us know about them. Very interesting article. I have the BTT remote and use it for some basic entertainment tasks in the evening (playing videos, adjusting volume and brightness etc). It generally works well but sometimes has connection issues. I think I will try out the other remotes you recommended. I have done the BTT course Bakari mentions above. It’s great. I use trackpad gestures frequently now on my Mac (before I didn’t use them at all). Hey Michael, thanks for the feedback. As I was writing the article, I realized I’m probably not maximizing the use of remote apps as much I could. Will definitely be thinking about other use cases. Thanks for sharing. Thank you so much for this write up! I have lots to look into and to look forward to. 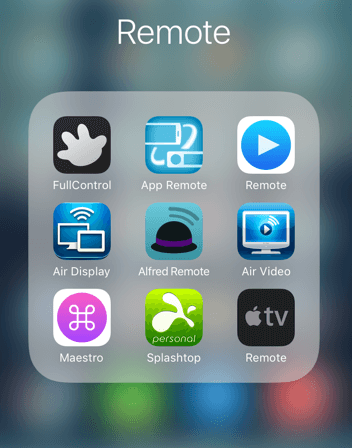 Unfortunately I only see a $5 version of the Alfred Remote for iOS, is there a free version as well? I have just recently downloaded the Keyboard Maestro iOS app, so I’m wondering if you think the Alfred app is worth it? Thanks again and I love your site! Hi Matthais, welcome to the site. I need to correct the mistake about the price. As for it being worth it, I would probably only get it if you want to trigger actions remotely. I don’t use it much because I work at my computer throughout the day, but like I said in the article, if I use an iMac as an entertainment center, I would probably use the remote apps more. Keyboard Maestro and it’s remote app can trigger similar actions as Alfred, but the Maestro remote app is not as well designed as Alfred’s. Glad to hear you downloaded Keyboard Maestro. I plan to create a course about it this year. But there are dozens of articles on this site to get you started. Please keep in touch about how you’re doing with KM. Feel free to ask questions. Btw, your digital article photography is very good. Wish I had more time for photography like I used to. I haven’t tried controlling remotely my mac thru my iphone. I was wondering before but opted not to continue searching because I though it would be really hard but what you shared on this post really help me out. Thanks for the detailed information. I will be trying those app real soon and hope to find the best app that will suit my taste. Do you encounter some lags when using phone as remote control? Danny, thanks for your feedback. I haven’t experienced any feedback, but that doesn’t it might not occur with some applications. Let us know if your encounter any problems.